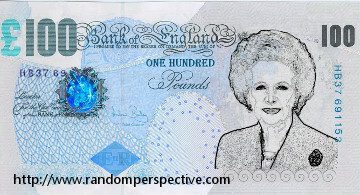 Following the popular decision to put Winston Churchill on the five pound note, the Bank of England has followed it up by making the extraordinary decision to put Margaret Thatcher on the One Hundred Pound bank note. Thatcher would not have seen the point of a hundred pound banknote as she preferred her small change in coins. "There is no doubt that Winston Church was a popular leader, even with people who did not share his political ideology. However, it must be said that amongst her supporters, Margaret Thatcher was an even more towering figure." He said. "It was therefore only suitable that we demonstrated this popularity by re-issuing the one hundred pound bank note and putting her face on it." 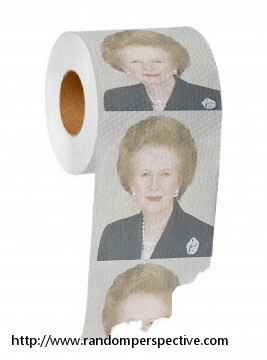 "Because Margaret Thatcher was a divisive leader, she was extraordinarily popular with some and extraordinarily unpopular with others, we have therefore taken the decision to represent this by also issuing her on toilet paper, to fairly reflect how the country feels about her." It was pointed out to Mr Wilson that his may not been seen as fair, because while people had a choice of what toilet paper they bought, they did not have a choice in what money they used. He said this wouldn't be a problem because those who wanted to see Thatcher on their toilet paper "would not be able to afford a one hundred pound banknote"